This is a time- and cost-effective in vitro protocol investigating the mechanisms of acquired resistance to targeted therapeutic agents, which is a highly unmet medical need in cancer management. Arienti, C., Pignatta, S., Zanoni, M., Cortesi, M., Zamagni, A., Piccinini, F., Tesei, A. 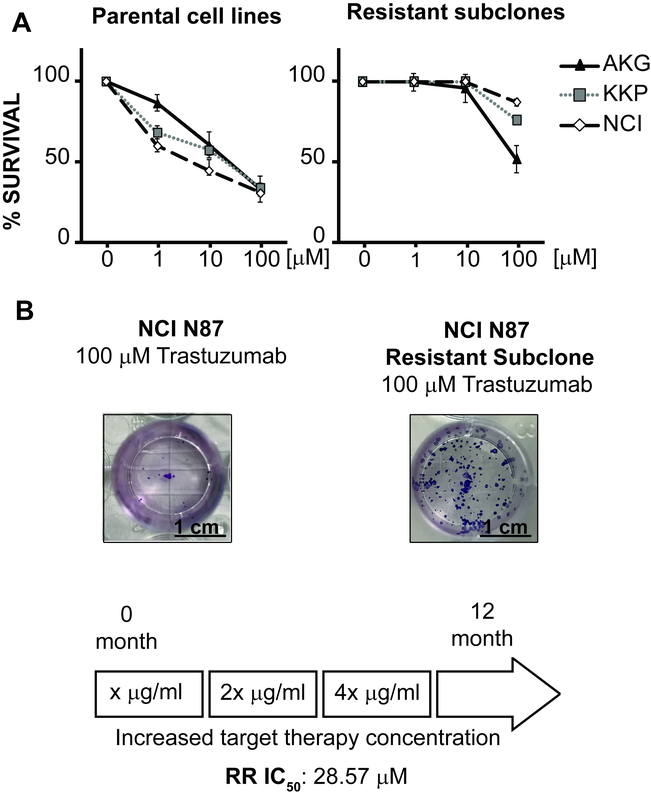 Looking for Driver Pathways of Acquired Resistance to Targeted Therapy: Drug Resistant Subclone Generation and Sensitivity Restoring by Gene Knock-down. J. Vis. Exp. (130), e56583, doi:10.3791/56583 (2017). The past two decades have seen a shift from cytotoxic drugs to targeted therapy in medical oncology. Although targeted therapeutic agents have shown more impressive clinical efficacy and minimized adverse effects than traditional treatments, drug resistance has become the main limitation to their benefits. Several preclinical in vitro/in vivo models of acquired resistance to targeted agents in clinical practice have been developed mainly by using two strategies: i) genetic manipulation for modeling genotypes of acquired resistance, and ii) in vitro/in vivo selection of resistant models. In the present work, we propose a unifying framework, for investigating the underlying mechanisms responsible for acquired resistance to targeted therapeutic agents, starting from the generation of drug-resistant cellular subclones to the description of silencing procedures used for restoring the sensitivity to the inhibitor. This simple time- and cost-effective approach is widely applicable, and could be easily extended to investigate resistance mechanisms to other targeted therapeutic drugs in different tumor histotypes. Following up on the crucial discoveries in molecular and cellular biology, a number of novel synthesized anticancer molecules have been developed to selectively target oncogenic signaling pathways in a broad array of tumor types. In particular, two categories of targeted therapeutic agents with unique properties in oncology, namely synthetic chemical compounds and recombinant monoclonal antibodies, are known to have achieved clinical successes and dramatically altered cancer care in recent decades1,2,3. Nevertheless, despite their impressive initial response to treatment, the majority of cancer patients have developed drug resistance to all targeted therapeutic agents, both monoclonal antibodies and kinase inhibitors. As a consequence, drug resistance, the major hurdle for classic anti-cancer medicines4, is still a great challenge for emerging targeted therapies5,6. Resistance to targeted therapy may be intrinsic (i.e., primary) or acquired (i.e., secondary). Intrinsic resistance describes a de novo lack of response to therapy, whereas secondary resistance occurs after a period of response to drug treatment7. The latter is caused by outbreaks of small cohorts of tumor cells within the bulk of the primitive tumor or nestled in distal cryptic anatomical niches, exhibiting up to 90% resistance to one or more targeted therapeutic agents. Molecular mechanisms underlying a resistance development to targeted therapy mainly result from target gene mutations and redundant activation of other pro-survival signaling pathways, whose understanding is still far from complete8. In this work, we proposed a time- and cost-effective approach to investigate in vitro mechanisms of acquired resistance to targeted therapeutic agents, starting from the generation of drug-resistant cellular subclones to the description of silencing procedures used for restoring the sensitivity to the inhibitor, a crucial tool used for testing and validating the working hypotheses. In particular, our approach was used to investigate, in gastric cancer, the resistance mechanisms to trastuzumab (e.g., Herceptin), a humanized monoclonal antibody targeting the extracellular domain of HER2 protein9. Trastuzumab + chemotherapy is widely accepted as the standard first-line treatment for HER2-positive metastatic breast cancer. Thanks to recent preclinical studies showing that anti-HER2 therapies have significant activity in both in vitro and in vivo HER2-positive gastric cancer models10,11, molecular drugs targeting HER2 have been extensively examined in clinical trials, some of which are still ongoing, on patients with gastroesophageal cancer12,13,14,15. These studies have emphasized the rising number of patients experiencing resistance to trastuzumab16, similarly to what is observed for other targeted therapeutic inhibitors. In particular, the response rate of trastuzumab was 47%, and the median overall survival for patients on trastuzumab + chemotherapy was only 2.7 months longer than for patients on chemotherapy alone17. This suggested that while primary trastuzumab resistance is prevalent, secondary trastuzumab resistance is inevitable. For this reason, there is urgent need to clarify the mechanisms causing HER2-targeted therapy resistance in gastric cancer, which is even more problematic given the intra-tumoral genetic heterogeneity of this neoplasia18. In addition, mechanisms of resistance to trastuzumab in gastric cancer have proven challenging to explain, partially due to the difficulty in obtaining reliable preclinical models representative of this condition. Oshima et al. reported an in vivo selection method of trastuzumab-resistant gastric cancer cell lines, consisting of a repeated culture of a small residual peritoneal metastasis after treatment with trastuzumab19. However, the need of an enclosure, of specific animal handling expertise, and of the approval of the Animal Ethics Committee contributed to making it a time- and cost-consuming method. The approach we describe in this work is simple and widely applicable, and could be easily extended to investigate the resistance mechanisms to other therapeutic drugs in different tumor histotypes20. NOTE: This protocol has been specifically adjusted for the analysis of the mechanisms underlying acquired resistance to trastuzumab of HER-positive gastric cancer cell lines. All laboratory instruments needed are reported in the Table of Materials. NOTE: This is the most critical and difficult to standardize step in the protocol due to the fact that different cell lines may exhibit different sensitivities to the targeted therapeutic inhibitor independently from their tumor histotype or drug concentration used. Culture NCI-N87 cell line in RPMI medium supplemented with fetal calf serum (10%) and glutamine (2 mM, 1%), as a monolayer at 37 °C, and seed it onto 25 cm2 culture flasks. Add to the culture medium in each flask 10 µg/mL of trastuzumab as the starting dose. Expose the cells to the starting dose until they resume growing. NOTE: The starting dose of the targeted therapy inhibitor should be 10-fold lower than its plasma peak concentration. Plasma peak concentration is the highest level of drug concentration detected in patient blood usually following multiple doses of standard therapy. This value can be retrieved from studies on pharmacokinetics. Monitor cell growth with the trypan blue exclusion method; when cell growth is resumed (typically after a period of two to three weeks), expose cells to a 10-fold higher dose concentration of trastuzumab. Expose cells to a gradually increasing dose of trastuzumab (from 100 µg/mL to 400 µg/mL) until cells keep growing (after about 2 weeks) despite the presence of a high drug concentration (at least 2.5 - 4-fold higher than the plasma peak). Perform a clonogenic assay to evaluate the level of resistance to targeted therapy at every change in the concentration of the target therapy inhibitor in the culture medium, and define relative resistance IC50 index (RR IC50) as follows. Seed 500 cells in 24 multi-well culture plates. NOTE: 5 wells must be prepared for each condition set. Expose cells to increasing target therapy inhibitor (trastuzumab) concentrations from 100 µg/mL up to 400 µg/mL. Incubate cells in a CO2 incubator at 37 °C for 15 days. After incubation, fix and stain samples as follows. Remove the crystal violet solution carefully by aspirating with a pipette and immerse plates in tap water to rinse off any crystal violet solution residues. Air-dry at room temperature for up to 2 days. Count colonies of more than 50 cells using an inverted microscope (4X magnification). NOTE: Two independent observers are needed for this. Calculate RR IC50 as the ratio between the IC50 value of target-therapy-resistant subclone cells and the value of the original/naïve cells. NOTE: After the characterization of gene expression, signatures associated with the acquired resistance to target therapy and any candidate gene as driver of resistance will be investigated through: a) RT-PCR, and b) Western blot analysis. Extract total RNA from cell lines using acid guanidinium thiocyanate-phenol-chloroform mixture (see Table of Materials). Perform reverse transcription (RT) reactions using random hexamer primers and set the thermal cycler as follows: priming at 25 °C for 5 min, RT at 46 °C for 20 min, and RT inactivation at 95 °C for 1 min. Use 400 ng of total RNA for a 20 µL reaction. Prepare the reaction mixture for sample as follows: 7 µL RNase free H2O, 2 µL cDNA (10 ng/µL), 1 µL 20x fluorescent-labeled target-specific probe, and 10 µL 2x Mix containing buffer, dNTPs, and DNA polymerase (see Table of Materials). Add 20 µL of the reaction mixture to each well plate and run the following program: holding stage at 50 °C for 2 min, at 95 °C for 10 min (1 cycle); then 40 cycles at 95 °C for 15 s and at 60 °C for 1 min. Recover cell suspensions by adding 2 mL of 0.05% trypsin/EDTA solution and allowing 2 - 3 min for trypsin to work. Add 2 volumes of medium containing 10% fetal bovine serum to neutralize trypsin (e.g., 2 mL of medium for each 1 mL of trypsin) and centrifuge at 1,200 x g for 5 min. Discard supernatant and wash cells with cold 1x PBS. Centrifuge at 1,200 x g for 5 min and discard supernatant. Resuspend the cell pellet with lysis buffer and incubate on a rocker at 4 °C for 30 min. The amount of lysis buffer depends on the number of cells (e.g., 100 µL for 1 x 106 cells); make sure to prepare fresh lysis buffer each time. For 1 mL of lysis buffer preparation (leave on ice): use 975 µL M-PER Mammalian lysate buffer, 15 µL protease and phosphatase inhibitors, and 10 µL 100 µM PMSF inhibitors. Recover the supernatant protein by cell lysate centrifugation at 13,000 x g at 4 °C for 15 min. Determine the protein concentrations by using a BCA protein assay. Add 4x LaemmLi Sample Buffer to protein samples (at least 20 - 30 µg of protein) and heat at 100 °C for 3 min. Use precast 4 - 20% gels and load 20 - 30 µg of LaemmLi protein solution and 5 - 10 µL of protein standard per sample. Electroblot to transfer protein into a PVDF membrane (see Table of Materials) by using a semi-dry system. Block the membrane by soaking in the appropriate protein solution (milk/BSA 5%) on the shaker at room temperature for 1 h.
Make a 1:400 solution with anti-IQGAP1 primary antibody in a 5% milk solution (see Table of Materials). Place the membrane in primary antibody solution on a shaker in a cold room overnight. The following day, discard the antibody solution and soak in T-TBS 1x solution (1x T-TBS: 1x Tris Saline Buffer added by Tween20 0.1%) on a shaker at room temperature for 7 min. Discard T-TBS 1x solution and replace. Repeat 3 times. Make a 1:10,000 secondary mouse-antibody solution by adding antibody for standard Western blot detection (see Table of Materials) and place the membrane on a shaker; leave at room temperature for 2 h.
Discard the antibody solution and soak in T-TBS 1x solution on a shaker at room temperature for 7 min. Soak membrane for 5 min in a chemiluminescent solution, and image the membrane on a chemiluminescence imager. Prepare single cell suspension by trypsinization. Perform transfection on the day that the cells are plated. Wash NCI-N87 cells with PBS and incubate at 37 °C with 0.05% trypsin/EDTA solution for 5 - 10 min. Add 2 volume of RPMI medium containing 10% fetal bovine serum to neutralize trypsin (e.g., 2 mL of medium for each 1 mL of trypsin). Count cells with a hemocytometer using trypan blue staining. Seed 2.5 x 105 cells (60% confluence) onto a T25 cm2 flask for each condition. NOTE: The appropriate number of cells for seeding is determined by the doubling time of the cell line and the duration of the experiment. The aim is to achieve the target gene knock-down for the entire duration of the experiment. Nine T25 cm2 flasks are ideal for transfection conditions and the clonogenic assay (3 flasks for controls, 3 flasks for negative transfection controls, 3 flasks for gene-target transfection). Prepare gene-target and negative control transfection mix for each T25 cm2 flask as follows. Dilute 12.5 µL of each gene-targeting siRNA oligonucleotides or Negative Control siRNA oligonucleotides in minimal essential transfection medium (ratio 1:55; see Table of Materials). Add a cationic liposome transfection reagent (1:1 ratio with gene-targeting siRNA oligonucleotides; see Table of Materials). Incubate at room temperature for 20 min. NOTE: The total volume of the transfection mix is 700 µL. Add 700 µL of the transfection mix to each T25 cm2 flask. Incubate cells at 37 °C for 1 - 3 days. Verify gene knock-down by RT-PCR and Western blot analysis. Double-check the impact of the putative R-gene knock-down on the sensitivity restoration to the targeted therapeutic agent through colony formation experiments (repeat Step 1.5 ). Figure 1 outlines the framework of the experimental procedure. Three gastric cancer cell-lines expressing a high level of HER2 and sensitive to trastuzumab (IC50 < peak plasma level of drug, Figure 2A, left graph) were grown in culture medium containing the targeted therapeutic agent. A dose 10-fold lower than the peak plasma concentration of trastuzumab (10 µg/mL) was set as the starting dose, and gradually increased to 400 µg/mL over a period of 8 - 12 months. Afterwards, we obtained three subclones characterized by a stable resistance phenotype with IC50 values lower than the peak plasma levels of trastuzumab (Figure 2A, right graph). In particular, the most resistant subclone, HR NCI N87, reached a RR IC50 value of 28.57 (Figure 2B). IQGAP1 appears to play a pivotal role in the resistance phenotype of the HR NCI N87 sub-line. The analyses of protein and gene expressions supported this hypothesis: the IQGAP1 protein level in the resistant subclone is about 5-fold higher than in the parental cells. Similarly, the correspondent IQGAP1 gene expression is 2.5-fold higher in the HR NCI N87 sub-line than in the NCI N87 line (Figure 3A). IQGAP1 gene silencing was performed to evaluate its role in the development of the trastuzumab resistant phenotype. The protocol used to silence IQGAP1 gene expression proved particularly efficacious to knock down the IQGAP1 protein content on almost all of the cells grown in a T25 cm2 cell culture flask (about 2.5 x 105 cells) (Figure 3A). 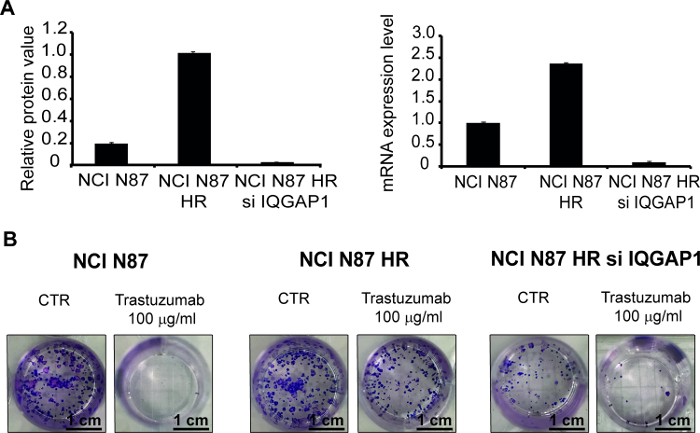 Furthermore, the clonogenic assay confirmed the working hypothesis, showing that IQGAP1 gene silencing restores trastuzumab sensitivity in HR NCI N87 cells as evidenced by the lowering of IC50 value to 7 µg/mL (Figure 3B). Figure 1: Framework for the in vitro analysis of the mechanisms underlying acquired targeted therapy resistance. Three different trastuzumab-resistant subclones derived from three different trastuzumab-sensitive cancer cell lines were generated and characterized for alterations in HER2-signaling mechanisms by next-generation sequencing, immunohistochemical, Western Blot, and RT-PCR techniques. All subclones showed a different resistance mechanism. Targeted-therapy sensitivity was restored in a specific subclone when candidate driver gene of resistance was silenced. Please click here to view a larger version of this figure. Figure 2: Determination of relative resistance IC50 index (RR IC50) via clonogenic assay in gastric cancer cell lines. (A) Growth curves data for naïve (left graph) and resistant (right graph) cell-lines generated by colony forming experiments. The x-axis represents trastuzumab concentration. Error bars represent standard deviation (SD). The standard deviation never exceeded 5%. (B) Representative images of the clonogenic assay supporting the generation of a NCI-N87-resistant subclone. As shown by the time line, the generation of HR trastuzumab NCI N87 cells required 12 months of continuous exposure to the targeted agent. This figure is adapted from the work of Arienti et al.9 Please click here to view a larger version of this figure. Figure 3: Restoring trastuzumab sensitivity by IQGAP1 gene knock-down. (A) IQGAP1 protein content, by densitometric analysis shown in the bar graph, in parental NCI N87 line, and in its resistant and silenced-resistant subclone (left graph). The mRNA IQGAP1 expression level was also verified in all the three cell-lines by RT-PCR technique (right graph). Data were presented as mean ± SD. 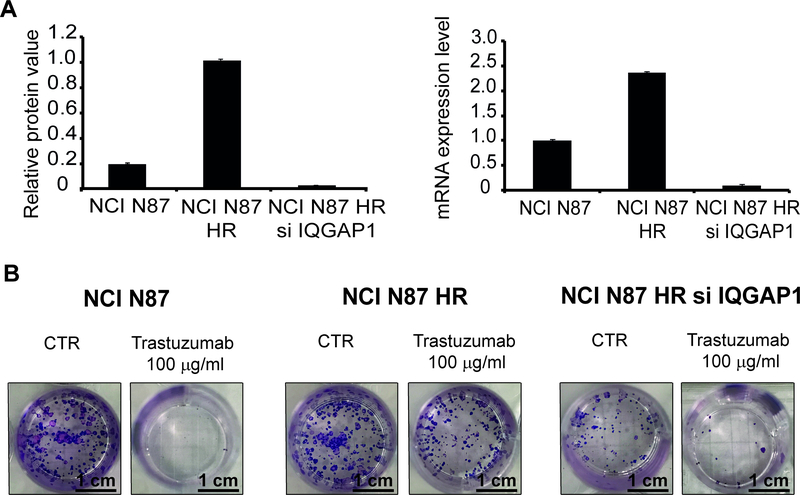 (B) Clonogenic assay showed the different sensitivity of parental NCI N87 line and in its resistant and silenced-resistant subclone to 100 µg/mL trastuzumab. The colony was counted after 14 days of cell seed. Thumbnail figures show representative colony cultures. This figure is adapted from the work of Arienti et al.9 Please click here to view a larger version of this figure. Table 1: Recommended reagent amounts and volumes for candidate resistance gene knock-down. While personalized and targeted therapies have elicited growing enthusiasm, these so-called 'smart' therapies face the same major hurdle as traditional chemotherapy drugs, i.e., the rapid and unpredictable acquisition of drug resistance. To improve the results of targeted therapy, drug-resistance problems must be solved through a better understanding of the mechanisms that cause them. Here, we presented a widely accessible in vitro methodology to investigate the mechanisms of acquired resistance to targeted therapy drugs in cancer cell line models. The generation of targeted therapy resistant subclones is the most critical and difficult to standardize step in this protocol, due to the intrinsic genetic heterogeneity between the cell lines used, and to their different degree of drug sensitivity. For these reasons, the time needed to obtain resistant subclones may vary. Chronic exposure to anticancer molecular agents typically causes a strong tumor growth inhibition. However, after a variable period of continuous drug exposure (8 - 12 months), cells resume growth with a rate similar to that of untreated control cells. In addition, despite that gene expression data have been used to hypothesize gene-related target therapy resistance, a different expression level does not always reflect an improper protein function or correlate with the resistance phenotype. Owing to the complexity of the relationship between the expression of the putative drug-resistant gene and the resistance to the targeted therapy, further molecular investigations are needed, such as bioinformatics analysis, including gene/protein interaction, biological process enrichment, and molecular modeling. Another critical point could be the specificity and the accuracy of siRNA oligonucleotide to reduce target expression. 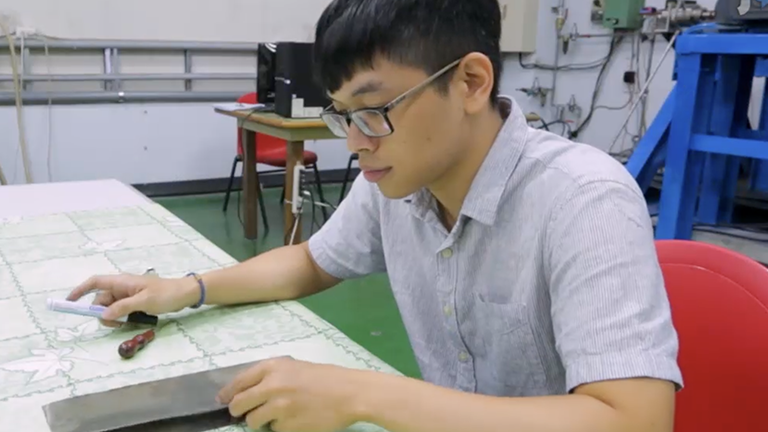 One possible solution could be the use of design tools for selecting functional siRNA, and a mixture of siRNA for the same target gene. Finally, a minor limitation is related to the method used to restore the sensitivity to the targeted therapy inhibitor due to the transient duration of transfection. Maximal knock-down of target mRNA (>85%) was reported on day 2 post-transfection and was maintained >80% through days 5 - 7. Significant knock-down, albeit lesser in extent, was still observed on day 6. For this reason, the cytotoxicity assay for verifying the restoration of drug sensitivity should be performed within about 5 days from gene silencing. Our protocol is a time- and cost-effective method for investigating in vitro acquired resistance. The generation of resistant subclones, mirroring the intra-tumor heterogeneity of cancer cells, could help unveil novel mechanisms of acquired resistance to anticancer targeted agents. In particular, they are more suitable for high-throughput genomic or proteomic screenings for identifying molecular alterations in resistant cells than their sensitive counterparts. This preclinical platform could be easily extended to investigate general resistance mechanisms to targeted therapeutic agents in different tumor histotypes, providing a standard procedure for the discovery of further drug targets to overcome drug resistance. The authors wish to thank Dr. Veronica Zanoni for editing the manuscript. ISCRIPT CDNA SYNTHESIS KIT Bio-Rad 1708891 The iScript cDNA synthesis kit is a sensitive and easy-to-use first-strand cDNA synthesis kit for gene expression analysis using real-time qPCR. TaqMan gene expression assay Life Technologies 4331182 Applied Biosystems TaqMan Gene Expression Assays consist of a pair of unlabeled PCR primers and a TaqMan probe with an Applied Biosystems FAM or VIC dye label on the 5’ end and minor groove binder (MGB) and nonfluorescent quencher (NFQ) on the 3’ end. M-PER Mammalian Protein Extraction Reagent Thermo Scientific 78501 Thermo Scientific M-PER Mammalian Protein Extraction Reagent is designed to provide highly efficient total soluble protein extraction from cultured mammalian cells. Halt Protease and Phosphatase Inhibitor Cocktail (100X) Thermo Scientific 78440 Thermo Scientific Halt Protease and Phosphatase Inhibitor Cocktail (100X) provides the convenience of a single solution with full protein sample protection for cell and tissue lysates. Pierce BCA Protein Assay Kit Thermo Scientific 23225 The Thermo Scientific Pierce BCA Protein Assay Kit is a two-component, high-precision, detergent-compatible assay reagent set to measure (A562nm) total protein concentration compared to a protein standard. 4x Laemmli Sample Buffer Bio-Rad 1610747 Use 4x Laemmli Sample Buffer for preparation of samples for SDS PAGE. For reduction of samples, add a reducing agent such as 2-mercaptoethanol to the buffer prior to mixing with the sample. 4–20% Mini-PROTEAN TGX Precast Protein Gels Bio-Rad 456-1094 Long-life TGX (Tris-Glycine eXtended) Gels have a novel formulation and can be used for both standard denaturing protein separations as well as native electrophoresis. Precision Plus Protein WesternC Blotting Standards Bio-Rad 1610376 Precision Plus Protein Prestained Standards are available in Dual Color, All Blue, Kaleidoscope, and Dual Xtra formats. All four have the same gel migration patterns, with 3 high-intensity reference bands (25, 50, and 75 kD). 10x Tris/Glycine/SDS Bio-Rad 1610732 10x Tris/glycine/SDS is a premixed running buffer for separating protein samples by SDS-PAGE. Trans-Blot Turbo Mini PVDF Transfer Packs Bio-Rad 1704156 Trans-Blot Turbo Mini PVDF Transfer Packs for fast, efficient transfer of proteins from mini gels using the Trans-Blot Turbo Transfer System. Each vacuum sealed, ready-to-use transfer pack contains two buffer-saturated ion reservoir stacks and a prewetted PVDF membrane. Precision Protein StrepTactin-HRP Conjugate Bio-Rad 1610381 StrepTactin-Horseradish Peroxidase (HRP) Conjugate for chemiluminescent or colorimetric detection of Precision Plus Protein Unstained Protein Standards or Precision Plus Protein WesternC Protein Standards on western blots. Immun-Star WesternC solution Bio-Rad 5572 Immun-Star WesternC solution, a method of protein detection , detects mid-femtogram amounts of protein. Universal Negative Control Invitrogen 12935300 Negative Control siRNA has no significant sequence similarity to mouse, rat, or human gene sequences. The control has also been tested in cell-based screens and proven to have no significant effect on cell proliferation, viability, or morphology. opti-MEM Glutamax Medium Thermo Fisher Scientific 51985026 Opti-MEM Medium is an improved Minimal Essential Medium (MEM) that allows for a reduction of Fetal Bovine Serum supplementation by at least 50% with no change in growth rate or morphology. Silencer Select Pre-Designed & Validated siRNA Ambion 4390824 RNA interference (RNAi) is the best way to effectively knock down gene expression to study protein function in a wide range of cell types. Lipofectamine RNAiMAX Transfection Reagent Invitrogen 13778075 Lipofectamine RNAiMAX Transfection Reagent offers an advanced, efficient solution for siRNA delivery. No other siRNA specific transfection reagent provides such easy and efficient siRNA delivery in a wide variety of cell lines including common cell types, stem cells and primary cells, as well as traditionally hard-to-transfect cell types. Gerber, D. E. Targeted therapies: a new generation of cancer treatments. Am Fam Physician. 77, (3), 311-319 (2008). Zhang, J., Yang, P. L., Gray, N. S. Targeting cancer with small molecule kinase inhibitors. Nat Rev Cancer. 9, (1), 28-39 (2009). Nelson, A. L., Dhimolea, E., Reichert, J. M. Development trends for human monoclonal antibody therapeutics. Nat Rev Drug Discov. 9, (10), 767-774 (2010). Chabner, B. A., Roberts, T. G. Timeline: Chemotherapy and the war on cancer. Nat Rev Cancer. 5, (1), 65-72 (2005). Gilbert, L. A., Hemann, M. T. Chemotherapeutic resistance: surviving stressful situations. Cancer Res. 71, (15), 5062-5066 (2011). Izar, B., Rotow, J., Gainor, J., Clark, J., Chabner, B. Pharmacokinetics, clinical indications, and resistance mechanisms in molecular targeted therapies in cancer. Pharmacol Rev. 65, 1351-1395 (2013). Ellis, L. M., Hicklin, D. J. Resistance to Targeted Therapies: Refining Anticancer Therapy in the Era of Molecular Oncology. Clin Cancer Res. 15, (24), 7471-7478 (2009). Asić, K. Dominant mechanisms of primary resistance differ from dominant mechanisms of secondary resistance to targeted therapies. Crit Rev Oncol Hematol. 97, 178-196 (2016). Arienti, C., et al. Preclinical evidence of multiple mechanisms underlying trastuzumab resistance in gastric cancer. Oncotarget. 7, (14), 18424-18439 (2016). Tanner, M., et al. Amplification of HER-2 in gastric carcinoma: association with Topoisomerase IIalpha gene amplification, intestinal type, poor prognosis and sensitivity to trastuzumab. Ann Oncol. 16, (2), 273-278 (2005). Bang, Y. J., et al. Trastuzumab in combination with chemotherapy versus chemotherapy alone for treatment of HER2-positive advanced gastric or gastro-oesophageal junction cancer (ToGA): a phase 3, open-label, randomised controlled trial. Lancet. 376, (9742), 687-697 (2010). ClinicalTrials.gov. Identifier NCT01130337. A Study of Capecitabine [Xeloda] in Combination With Trastuzumab [Herceptin] and Oxaliplatine in Patients With Resectable Gastric Cancer. Available from: http://clinicaltrials.gov/show/NCT01130337 (2017). ClinicalTrials.gov. Identifier NCT01748773. A Study of the Combination of Oxaliplatin, Capecitabine and Herceptin (Trastuzumab) and Chemoradiotherapy in The Adjuvant Setting in Operated Patients With HER2+ Gastric or Gastro-Esophageal Junction Cancer (TOXAG Study). Available from: http://www.clinicaltrials.gov/show/NCT01748773 (2017). ClinicalTrials.gov. Identifier NCT01472029. Explorative Phase II Study of Perioperative Treatment in Patients With Adenocarcinoma of the Gastroesophageal Junction or Stomach (HerFLOT). Available from: http://www.clinicaltrials.gov/ct2/show/NCT01472029 (2017). ClinicalTrials.gov. Identifier NCT01196390. Radiation Therapy, Paclitaxel, and Carboplatin With or Without Trastuzumab in Treating Patients With Esophageal Cancer. Available from: http://clinicaltrials.gov/show/NCT01196390 (2017). Shimoyama, S. Unraveling trastuzumab and lapatinib inefficiency in gastric cancer: Future steps (Review). Mol Clin Oncol. 2, (2), 175-181 (2014). Kelly, C. M., Janjigian, Y. Y. The genomics and therapeutics of HER2-positive gastric cancer-from trastuzumab and beyond. J Gastrointest Oncol. 7, (5), 750-762 (2016). Wong, S. S., et al. Genomic landscape and genetic heterogeneity in gastric adenocarcinoma revealed by whole-genome sequencing. Nat Commun. 5, 5477 (2014). Oshima, Y., et al. Lapatinib sensitivities of two novel trastuzumab-resistant HER2 gene-amplified gastric cancer cell lines. Gastric Cancer. 17, (3), 450-462 (2014). Pignatta, S., et al. Prolonged exposure to (R)-bicalutamide generates a LNCaP subclone with alteration of mitochondrial genome. Mol Cell Endocrinol. 382, (1), 314-324 (2014).